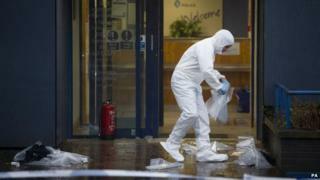 A woman who apparently set herself on fire at a Scottish police station is in a critical condition in hospital. The woman suffered serious burns in the incident in the reception area of Clydebank police station, in the town's Montrose Street, at 09:55 on Wednesday. The reception area was closed while officers carried out investigations but has since re-opened. The injured woman was attended by paramedics before being taken to Glasgow Royal Infirmary.